When buying products for home, people often choose those made in their own country, not just because they believe that there are no better than that, but also to support their homeland economy. It is hard to find coffee makers and espresso machines that are not made in China, but it is possible. Some of the coffee machines that were previously manufactured in countries like USA, Italy, Swiss or Great Britain, moved their production to other countries, most often in China due to very low production costs. In this list, you will find reviews with top recommended coffee machines that are not produced in China, small ones and those with fantastic program options, all to satisfy your desire to find a quality coffee machine that suit your needs. 8 KitchenAid KCM1204OB 12-Cup Coffee Maker made in USA? We will start with Italian coffee makers since Italy is a country that invented espresso and culture of coffee drinking. Italian manufacturers mostly produce espresso makers but they also produce programmable espresso makers with options to make coffee as well. DeLonghi ESAM3300 Magnifica is made in Trevino, Italy. DeLonghi Magnifica is actually a programmable espresso maker. It gives you several options and with them, you can make coffee as well. This is a fantastic machine which every coffee brew turns into a pleasure work. 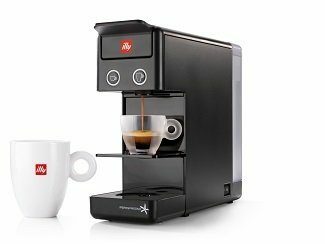 With drink options you can make espresso, coffee, cappuccino, and latte, it has a beans-to-brew option which gives you a possibility to grind beans right before brewing which gives your drink a really fresh taste. If you don’t want to use your built-in adjustable conical low-pitch burr grinder, you can use ground coffee, just use a special chamber for it. On the top of the coffee machine, there is a warm plate where you can warm up your cups for espresso. All options you can use thanks to the rotary and push buttons. On the front side of a coffee maker there is a steam nozzle for making a perfect milky foam. You can rotate steam nozzle up to 180 degrees in order to put any size of a cup under it. Also, its coffee spigot can be adjusted to any cup size. With this machine, you can customize your drink and the machine will remember all the settings that you made from size to strength. It can brew several drinks in a row without waiting for water to warm up thanks to a reheat and double boiler system. Removable water reservoir has 60 oz capacity and it is perfect when you have company eager to taste coffee made by this fantastic coffee maker. Another great coffee machine made in Italy, Milano. Gaggia Anima Prestige is also a programmable coffee maker. With one touch options, you can choose between espresso, coffee, cappuccino, latte and many others. Every brew option gives you several levels to choose. Strenght, size, temperature (Min/177.5 °F, Med/182.9 °F, Max/184.5 °F), everything is adjustable to suit your taste. With this coffee maker, you can use either ground coffee as well as whole bean coffee. There are, however, separate chambers for whole bean and ground coffee. It has a large 60 oz water reservoir which is removable and easy to refill and clean. Milk carafe and frother is set on the left side of a machine and dispense milk right into a cup. The brew group can be also easily removed which makes its maintaining stress free. If you have a desire for Americano coffee or tea, you can just remove milk carafe and add water spout on its place. Milk frother, as well as the brew group, have an automatic clean option in order to save the machine from any premature malfunction. Beside fantastic brew options, this coffee maker has a really modern look. It is made of stainless steel, with side panels made in high-quality plastic in black color. Machine dimensions are 8.7 x 16.93 x 13.38 inches. 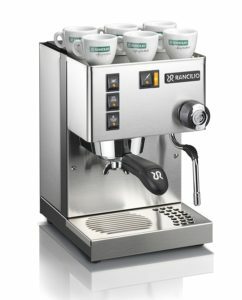 Rancilio Silvia is actually an espresso machine, but it is programmable and some of its parts are adjustable, like drip tray, so you can make coffee, Americanos, cappuccino, latte, and others. It is manufactured in Italy. Rancilio Silvia has a wand for hot water and steam so you can also make tea, hot chocolate, or milky foam for your cappuccino. The steam wand is also adjustable in order to make milk steaming in large carafes easy. Its look is exactly what a professional espresso machine should look like. It comes with two filter baskets ( for single and double serve), 7 gram coffee scoop, and plastic tamper. It doesn’t have built-in grinder. You can buy a separate one, or just use pre-ground coffee. Its water boiler is 0.3 liter capacity and it has a short recovery time between drinks. Stainless steel steam wand makes a perfect foam for your favorite milky beverages. On the top of this espresso maker there is a hot plate for warming cups. Dimensions of this coffee maker are 9.2 x 11.4 x 13.3 inches. Rancilio Silvia espresso machines are built to last. This one will serve you well for a very long time. 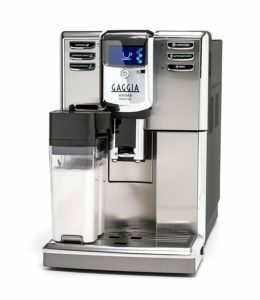 It is one of our favorite coffee machines made in Italy and our top pick and top recommended coffee machine that was not made in China. 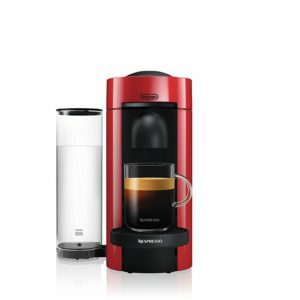 If you are looking for a small coffee maker with an affordable price this one is right for you.It doesn’t have built-in grinder or chamber for ground coffee, this one is made for illy iperEspresso and Coffee Capsules. Every use of capsules makes coffee brew an easy work. Its control panel is set on the front side of the machine and you can choose between two options, espresso or coffee. This one has a 25,4 oz reservoir, its dimensions are 3.9 x 12.2 x 10.4 inches, and it has used capsules drawer with 7 capsules capacity. 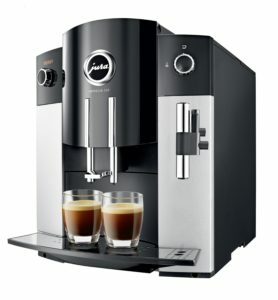 Although, some of Jura coffee machine still have its production in Switzerland, this one particular is manufactured in Portugal. This is a programmable coffee machine and with switch rotary system you can customize your drink. 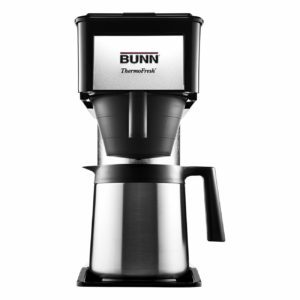 It has a conical grinder that gives you fresh coffee every time you turn your machine on. Foam frothier makes fantastic milky light foam for your cappuccinos. You can drink your coffee from your favorite cup no matter what size it is, the coffee spout is adjustable and can be adjusted from 2.6 to 4.4 inches. Removable water reservoir makes refilling and cleaning really easy. If you want to know more about this coffee machine read our article Jura Impressa c60 and c65 For those who like others variations of coffee Jura IMPRESSA C65 coffee machine is a right choice. KBG Polished Silver by Technivorm Moccamaster is coffee maker manually manufactured in Amerongen, Netherlands. It high-quality workmanship guarantees that there will be no need to buy any other coffee machine. This coffee maker is not built to brew single shots, it has 10 cups or 40 oz carafe made of glass and it is equipped with a hot plate that keeps the temperature between 175 to 185 degrees. There are several models of KBG coffee machine with stainless steel carafes. All coffee makers and grinder produced by Technivorm Moccamaster are made of quality materials that are eco-friendly, recyclable and energy efficient. All plastic parts are BPA and BPS free. It saturates coffee through nine holes in outlet arm creating the ability to prepare fresh and flavored coffee in just 6 minutes. 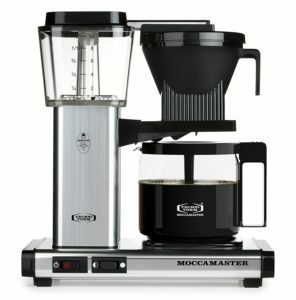 Moccamaster coffee machine has a unique look and you can choose between 19 color variants. If you are looking for a long-lasting drip coffeemaker that is not manufactured in China, that is energy-efficient, that is certified by the ECBC, SCAA and SCAE, automatic, then Moccamaster is the best choice for you. Nespresso is a Switzerland company and DeLonghi is Italian manufacturer, but VertuoPlus coffee maker created in cooperation between this two companies is manufactured in Hungary. It is very simple to use and its perfect for those who don’t have time to prepare coffee like barista. This small coffee maker is created to use VertuoLine capsules, it uses large capsule for coffee and a small one for espresso. There are only two sizes of beverages 8 oz. for coffee and 1.35 oz. for espresso, and you don’t have many options since this is not a programmable coffee maker. The 40 oz water reservoir can switch positions and you can set him on the side or behind the machine. For brew method, it uses the so-called centrifusion, where the capsule is rotating 7000 in minute creating fantastic and creamy beverage. VertuoPlus also has a 10 capsules capacity container for used capsules. Its new model gives a third option for beverage size. It is Alto, 14 oz rich taste coffee. Welcome gift that you get when buying this coffee maker introduces you with various flavors of coffee. KitchenAid KCM1204OB 12-Cup Coffee Maker made in USA? KitchenAid is an American manufacturer with a wide range of home appliances, some of them are still made in USA, but some are made in China. We could not find the clear information about this product so we will write about it like it is made in USA. We find information on site Younkers and on some other sites that is KitchenAid KCM1204OB 12-Cup coffee maker made in U.S.A. but we can not be sure because there is no official information about where made this coffeemaker . 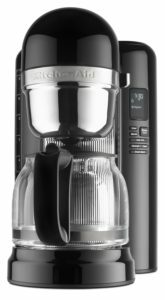 KitchenAid 12-Cup Coffee Maker is an affordable coffee machine for coffee lovers. It is programmable in one way since it has a timer, brew pause, the choice between regular and bold coffee, an option for the coffee amount for a small batch. There is no option for single serve, just 12-cup carafe or 2- 4 cup option. This coffee maker is equipped with a gold-tone filter. You can use paper filters number 4 if you like coffee without a sledge. 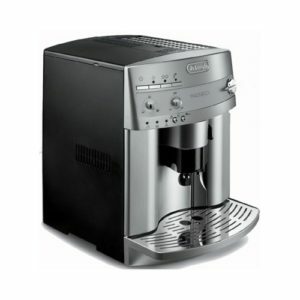 This is a good coffee machine with reasonable price and good options. BUNN company is known as an American manufacturer, but some of their products are still made in the USA and some are produced in China. We did a small research and find out that this model is assembled in America. What does it mean? That mean that at least some parts are produced in other country (maybe China). On the other hand, some consumers said that this model was made in China and that it is written that way on the coffee maker box. It is common that coffee makers are made with carafe rather than as a single serve unit, although you can find that type of coffee maker too. This one coffee maker has a thermal carafe and stainless steel water reservoir. It can prepare 4 to 10 cups of coffee in 3 minutes and it can preserve coffee in warm state for about 2 hours. You can only use ground coffee with this model. It is perfect for families where several members drink coffee. 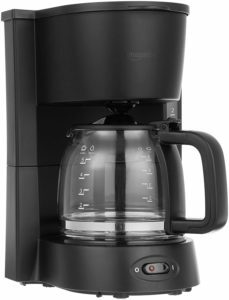 This 5-cup coffee maker is produced by AmazonBasics and it is made in Mexico. It is a very cheap product but it does a great job. The users claim that it is great when you are always on a run. Its glass carafe is created to make 5 cups of coffee, but the bad side is that you have to wash it manually, it is not dishwasher safe. This is a simple machine, you measure ground coffee and let the coffee maker do its job. You can use paper filters from any manufacturer, and the only option that this coffee maker offers is brew pause. You can grab your cup while its still preparing coffee. Its dimensions 9.5 x 7.3 x 10.5 inches says it is actually a small unit although it is a carafe coffee maker. Perfect for small kitchen counters. We are sure you will find the right coffee maker on this list of Top 10 Recommended Coffee Makers Not Produced in China. We have to emphasize that many manufacturers moved their production in countries like China. You can still find some of their products made in USA or Italy, but some newer models are likely produced in some country where production expenses are lower. They always say that the quality is the same because products are made according to high standards but people just don’t like to see the label „made in China“. We worked really hard to find those still made in some European country or USA. If you are interested in American made products you may be interested in articles about coffee mugs made in USA. We really did work hard to find all the American made coffee cups. We hope that you enjoyed in this informative article and that we help you to choose the right coffee machine for you. If you choose to shop, you will never make a mistake with Italian coffee machines. Italians know what a good coffee is and what kind of coffee machine is needed to make it.